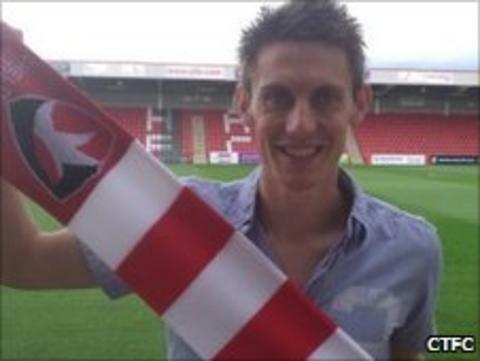 Cheltenham Town have signed former Bristol Rovers striker Darryl Duffy on a two-year deal. The 27-year-old Scotsman was released by Rovers at the end of season after scoring 19 goals in 83 appearances during his three-year spell. "It didn't work out the way I hoped last year but it's a new start for me here," he told BBC Gloucestershire. Meanwhile, Cheltenham are also close to signing Huddersfield striker James Spencer, 19, on a six-month loan deal. Spencer spent last season on loan at Morecambe and played against the Robins in their 1-1 draw at Whaddon Road in November. Duffy hopes his move to Cheltenham will see him become more prolific in front of goal. "It's an opportunity for me to get back and start games and hopefully score a lot of goals," he said. "Whenever I've played regularly I've always scored goals so I'm confident I can if I'm given the chance and that's what I'm here to prove." Duffy started his career in the SPL with Rangers before securing a move to Falkirk and became their top scorer in the 2004/05 season. He left Scotland for Hull City in 2006 before joining Swansea and then Rovers. After a solid first season at the Memorial Ground, Duffy found it hard to maintain his form and was loaned to Carlislie. He spent last term on loan at Hibernian but was restricted to playing just seven games after breaking a bone in his foot.